So you want to do a bit of targeted military research this Memorial Day weekend. And you want to check out MyHeritage to see what it can do for you in terms of records availability. Here’s your chance to do both, free. 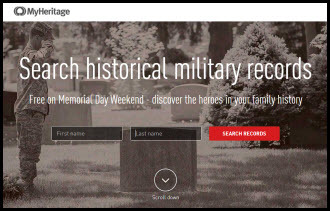 As of right now, and throughout the Memorial Day Weekend, millions of U.S. military records have been made searchable, for free, at MyHeritage. The entry page for this set of records is here: http://pages.myheritage.com/memorialday/. Now this won’t get you access to the part of MyHeritage that The Legal Genealogist thinks is what makes it stand out: the Smart Matches of persons in family trees that has helped so many of us — me included — connect with European cousins. But it will give you a taste of the records available at this subscription site, its searching methods and similar features. What’s included in the military collections available this weekend? That translates this way. The military collections are broken down into three broad groups: Draft, Enlistment & Service; Pension Records; and Military Documents. Each category has a fairly eclectic mix, and not all records are from the United States.